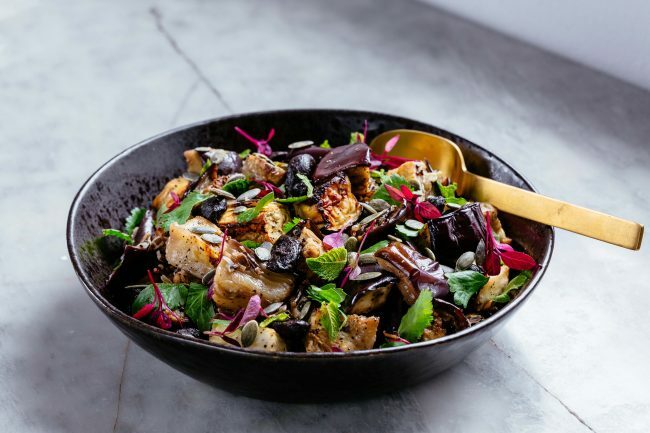 Sweet roasted aubergine and nutty black rice, what’s not to love?! This is a stunning and simple combination of quality ingredients that you’ll easily find in your local supermarket. Dish it up as a more-ish side at social gatherings or serve as a main for a wholesome veggie dinner. Pre-heat the over to 190C. Dice the aubergine and then dress in oil, salt and sumac. Roast for approximately 20 minutes or until cooked. Cook the wild rice in seasoned water until tender and place to the side to cool. Pick the herbs into small leafs, be generous here – you can never have too many fresh herbs! Toast the pumpkin seeds in the oven for 10 mins at 170C or until lightly browned. Combine all the ingredients in a sharing sized bowl, dress with extra virgin oil and a sprinkling of herbs. Discover this recipe and simple styling tips to make black foods and black tableware work for every occasion on the Habitat website.